medical product, Stryker selected the Green Hills development solutions for their reliability and security. 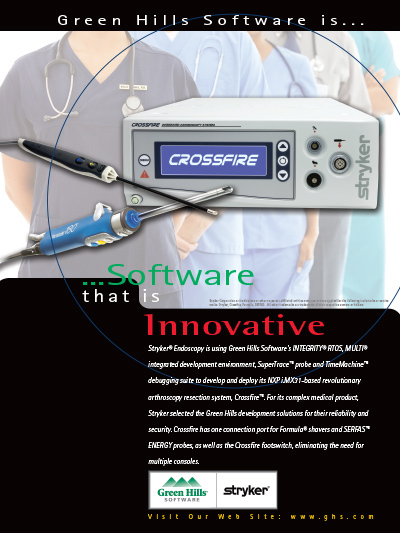 Crossfire has one connection port for Formula® shavers and SERFAS ENERGY probes, as well as the Crossfire footswitch, eliminating the need for multiple consoles. Stryker Corporation or its divisions or other corporate affiliated entities own, use or have applied for the following trademarks or service marks: Stryker, Crossfire, Formula, SERFAS. All other trademarks are trademarks of their respective owners or holders.